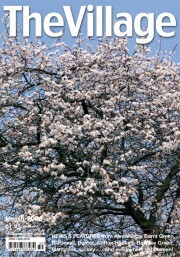 Our March 2005 cover celebrated the start of spring with a picture of blossom in Alvechurch centre. The Village launched a campaign to stop traffic speeding through our streets, calling on Alvechurch ward councillor George Lord to take action ahead of the Worcestershire County Council elections in May. With a General Election also imminent, we introduced two of the candidates for Bromsgrove MP. 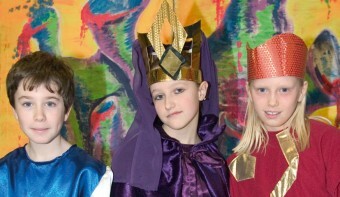 * More than 50 Alvechurch Middle School pupils, including Ryan Shepherd, Lucy Morton and Kath Nesbitt (above), had staged a colourful production of The Seven Sided Dice, a musical fantasy about children trying to find their way out of a weird world of games. 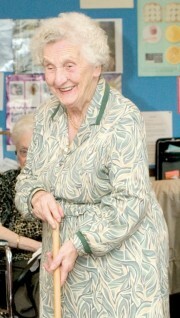 * Barnt Green Day Centre, run entirely by volunteers, was celebrating 15 years of providing fun and friendship to elderly and housebound people from the Village area – such as Cofton Hackett resident Alice Casey (left), who was still enjoying a game of croquet at the age of 97.